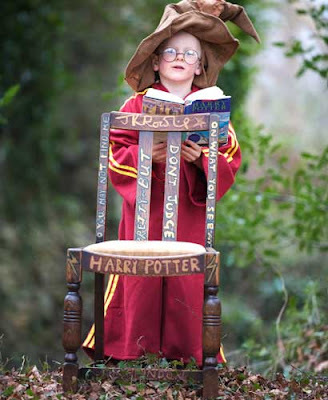 Ananova ran an article on Harry Potter chair which is being listed on eBay for charity. This isn’t exactly Harry Potter chair but the chair which the author of Harry Potter, J. K. Rowling, sat on as she wrote the first two books of Harry Potter; The Philosopher’s Stone and Chamber of Secrets, in her council flat. Hhmmm I remember reading once that she wrote her books in a neighbourhood coffee shop because her flat does not have heater or something like that. Anyway, this chair is endorsed by J. K. Rowling herself. 20% of the proceeds from this sale on eBay will go towards Books Abroad charity, a charitable organization that sends free school books to impoverished countries. This is probably a chair that a collector of Harry Potter memorabilia would want to invest in. A Harry Potter fan would want to keep it but I am not sold to Harry Potter at all and didn’t I read somewhere that some else in America was screaming that her boy wizard idea was stolen? Wonder what happened to the legal suit. Lol that kid in the pic is me, not joking. lol.